8 reasons why your packaging operation needs Carton Coding SOP protocols. A standard operating procedure, or SOP, is a set of step-by-step instructions to help workers carry out routine processes in a manufacturing environment. SOPs aim to achieve efficiency, quality output and uniformity of performance, while reducing downtime. 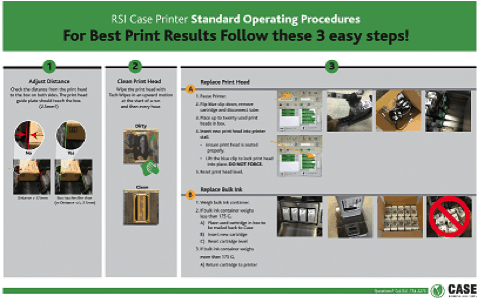 At Case Printing Solutions, we learn everything there is to know about a manufacturer’s package coding operation to document SOPs. SOPs are tedious and time-consuming, and most companies simply don’t invest the time to properly train and educate their line employees. We visit multiple customers every year and see the same issues time and time again. We have tested and found the best way to communicate with employees. And we document the entire coding process to ensure your employees are equipped to provide excellent print quality, so customers don’t complain or issue chargebacks. Here are 8 reasons why your packaging operation needs SOP protocols for Carton Coding. Better Communication – Well written SOPs clearly communicate responsibilities to employees. They don’t have to rely on their memories, or all the things they learned in their training when first hired. Consistency and quality control – SOPs ensure that no matter what day it is or who is working, the tasks that keep your organization running effectively will be done the way you want them done. They provide security because each employee knows what’s expected of him or her, rather than guessing what needs to be done daily. Increase line productivity – People who have had clear communication about what’s expected of them are more productive and more likely to achieve peak performance. SOPs also increase productivity for managers by saving them time “retraining” employees or reminding them of what needs to be done daily. Facilitate cross training – Many organizations have “key players” who are the only employees who normally perform certain tasks. SOPs allow other employees to fill in and complete tasks they don’t normally perform if those key players are on vacation or out sick. Essential to the employee performance evaluation process – Without SOPs, job performance often becomes a matter of opinion. With SOPs, managers can clearly identify employee successes and communicate deficiencies during quarterly or annual performance reviews. Peer accountability and coaching – When SOPs are clearly documented, employees can help and coach each other when learning new processes, rather than relying on a manager to do so. They also give employees the opportunity to correct / redirect their peers when tasks aren’t being performed correctly. Safer work environment – Clearly written SOPs, along with proper training, reduce the likelihood of accidents and injury. They may also reduce legal liability should an incident occur. Motivation to do things RIGHT – Well written SOPs not only outline the HOW of procedures, but also the WHY. When you communicate sound reasons why employees should perform tasks in a certain way, they’re more likely to do so.